Fall represents for many of us a time to decorate and refresh our homes. I love making things that are inexpensive and earth friendly for my home. It's amazing how many different kinds of accent pieces you can create using ordinary newspapers. From flowers, vases, baskets and even a holiday tree, it's interesting to see how newspaper can be transformed into very unique decorative objects. And the best part, they costs next to nothing to create. So, how did I make this framed mirror? 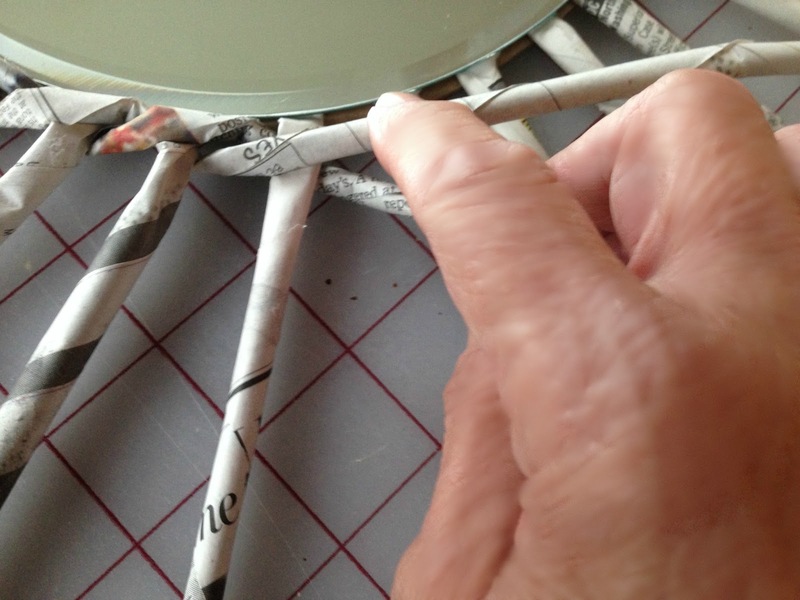 I started by cutting strips of newspaper, rolling them up using a thin wood skewer and . . .
gluing the triangular ends with plain white glue. Next, I placed the tubes on a cardboard circle the same size as the mirror in a clockwise pattern . . .
filling tubes in-between . . .
and gluing in place with a fast grab tacky glue. Next, I placed together two additional tubes horizontally, gluing in place, and then clamping down to dry. After drying, I glued the mirror on top with tacky glue, weighing down with a heavy object to dry. To weave the frame, begin by taking the two tubes twisting one over the other, and picking up the next tube, over one, and between the tubes. Continue twisting the horizontal tubes and picking up the next tube between the twisted tubes - or one tube over and one tube under. Lengthen the twisting tubes by adding glue to the tube end and inserting a new tube. It may be necessary to twist the tubes more between tube spaces before overlapping the next tube. Be sure to tighten and push together the rows as you progress. To finish off the rows, tighten any loose areas by pushing the rows together and then turn the frame over to the back. 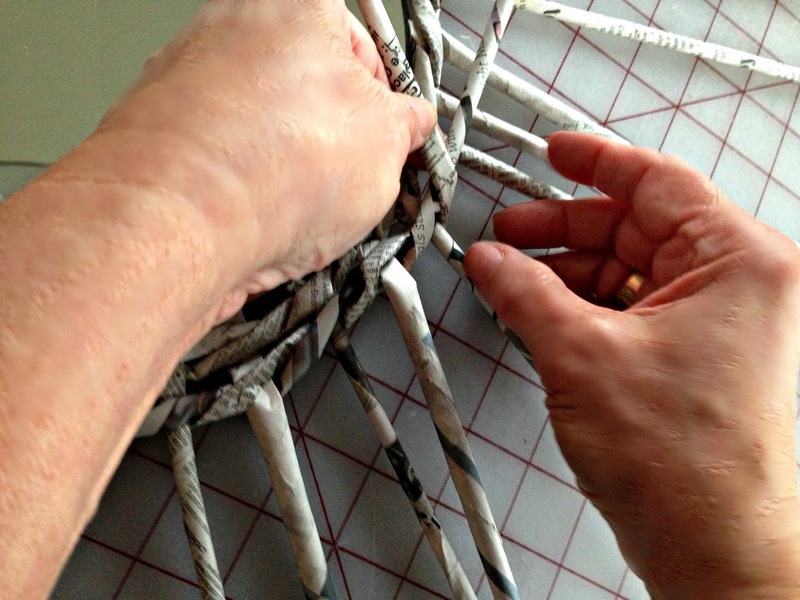 Place tacky glue on each tube at woven edge and bend the tube over, clamping down to hold until dry. Once dry, cut off excess tubing. Spray on a matte varnish or sealant after covering mirror for protection. Add a removable command strip for hanging on the back cardboard. This handcrafted framed mirror from recycled newspapers is an earth friendly inspired accent piece that's very stylish, innovative and inexpensive! Your mirror turned out really great Gail! I love that the frame is made of newspaper tubes. Love it! Gail, your mirror is so cute. Thrifty, fun and so unique. You are so good as providing tutorials as well. Happy weekend. This is a great project. I will certainly need to give this a try. I love this idea, using a 'throw away' to create beauty Well Done! So glad you were able to make it to Family Joy Blog Link Up party this week. What a cool project! I bet it was so satisfying to make. Love the finished product. Pinned and sharing. Thank you for linking up to Family Joy Blog Link-Up Party this week! Gail this is absolutely stunning. You would never know it was made from newspapers. You are truly a wonder. The environment loves you Gail!! Oh wow...this is so neat! How creative, it came out so beautiful :) Thank you so much for joining the party at Dishing It & Digging It! Hope to see you share with us this week! Very clever. I love repurposing. Thanks for sharing with us at Merry Monday.